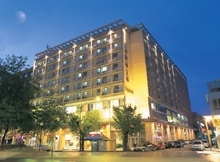 The largest hotel in Thessaloniki, Capsis Hotel stands in the heart of Thessaloniki (18 Monastiriou str.) 17 kilometres away from the international airport and parted 300 metres from the railway station, within easy reach of museums, historical sites, shops, nightclubs and traditional tavernas. Comfort, professionalism and superb level of services represent the core qualities offered in Capsis Hotel Thessaloniki. Latest technology designs and recent renovation have made Capsis one of the best-known and foremost central hotels in Thessaloniki, being an ideal option for business meetings, conference receptions and tours around the city of great religious and cultural significance. The Capsis Hotel, a representative member of the eminent Capsis Hotel Chain, is the largest city hotel in the Northern Greece. The hotel's 407 rooms and 18 Conference multi-use centers are fully supplied with upgraded technological equipment, aiming to satisfy the demanding needs of the modern businesspeople. The hotel is carefully designed to enable access and transportation of individuals with special needs throughout all main hotel facilities. Capsis Hotel offers a range of three different categories of Club rooms-Club Business, Club Elegance and Club Classic to choose from. Differentiation criteria are based on the guest’s aesthetical approach as well as the scope of his/her visit. Executive rooms, Junior & Executive Suites, complete capacity of the 407 rooms of the hotel. The total of ten rooms and all public areas area particularly designed to meet the needs of the physically challenged. Every room is fully equipped with wireless internet access and all the necessary gadgets that will satisfy even the most eclectic visitors. 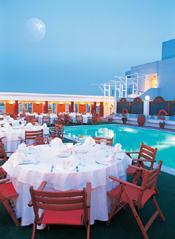 The impressive "Byzantium" restaurant can host private dinners for 300 persons or receptions for 450. The new Stay Late service allows guests to checkout at 8 p.m. instead of the traditional 12 p.m. deadline, essentially gaining an extra day in the city, free Wi-Fi, round-the-clock room service, secretarial service, medical service, babysitting service, currency exchange, laundry and dry-cleaning service, safe deposit boxes, car rental, organized excursions, reservations and bookings, underground parking for 50 cars, are also available. The Conference Center of Capsis Hotel has 18 conference, seminar and reception rooms, professionally supplied with the latest technology equipment, natural light, no obstacles blocking the view and direct contact with the kitchen. Their total capacity exceeds 2000 people, while if used independently, the venues can host a range of 8 to 500. Our competitive advantage is the congress lobby of 750sqm outside Theodora, an ideal place for placing stands of the sponsors of each congress. The Hermes Health Studio is a gym fully supplied with the latest equipment, saunas and revitalizing massages performed by professional physiotherapists. Club members and hotel guests are invited to create personalized work-out programs alongside trained specialists, enjoy relaxing massages and bask in the sauna’s rejuvenating heat. Irene’s Piano Bar has its own fanatic fans. Live music, large repertoire of songs and adequate service placed it among the best piano-bars of Thessaloniki. During the summer, guests of Capsis Hotels can enjoy refreshment drinks and snacks near the outdoor swimming pool at roof garden.